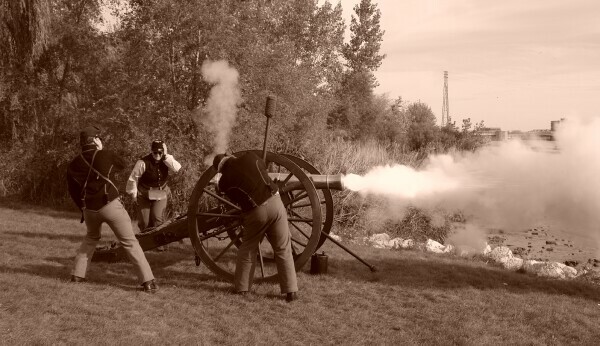 For 17 years Bay City's river front has seen history come alive as hundreds of reenactors fill the park with tents, camp fires, colorful costumes and enough history to cover centuries. Walking the encampment over the three days MyBayCity took hundreds of photos and heard dozens of stories and histories. These reenactors know their characters and time lines well and have wonderful stories to share. This article is a selection of some of our favorite photos. The sepia tone shots were inspired by Bill Badgley and his Civil War photography studio. Bill, who's in the air conditioning business in modern times, got into historical photography about 5 years ago. He built his first camera then later found an original in fairly good shape. Bill researched photography of the era and built his Civil War Engineer Department Photographic Wagon. He taught himself the old tintype methods. Bill's tintypes are very popular with the reenactors, even if they do have to sit still for the long exposures then wait for each photograph to be developed in the wagon. The results are well worth the wait since they are genuine period photos made with original equipment in the same way it was done in the 1860's. "The only bad thing is that when I sell a photo it's gone. There's no negative to make a copy from. The one I take is the only real one." The stories were everywhere. If you ask a question there was an answer. Mrs. Lincoln told of President Lincoln's life around the time of the civil war. She also told how Uncle Sam as we have come to know him was at one point patterned after Lincoln. A later artist change the look to favor himself, but Lincoln's influence remained. Reenactors are something of a family. They see each other at camps and renew old friendships. And they help where needed. Youngsters Emily OLaughlin, Rachel Mann, Justin Isbel and Annie Chapman were passing by the country Store Sunday morning when someone ask for help setting up. The four didn't hesitate to help setup and put fresh apples into baskets. River of Time 2007 has now ended but it's certain that history will repeat itself in September 2008.